From Left to Right: Martina Gebbe, Sven Abend, Matthias Gersemann, Holger Ahlers, Hauke Müntinga; (top right) Claus Lämmerzahl, (bottom right] Ernst M. Rasel. The precise knowledge of gravity is important in the fields of geodesy, geophysics and metrology. Detecting small variations in the local gravitational force, for example, can provide information about the presence of mineral resources. Tectonic movements or volcanic activities can also be deduced by this method. Satellites allow the observation of the gravitational field of the whole planet yielding important parameters for climate studies such as sea-surface heights  or ice masses . Moreover, gravity is a force that cannot be shielded and, thus, influences the measurement of other standard units. Absolute classical gravimeters are based on tracing the free fall of macroscopic corner-cubes with laser interferometers, while the lab frame serves as inertial reference. Quantum inertial sensors operate similarly using freely falling atoms as test masses. They are based on the wave-particle duality stating that particles also have a wave nature and can therefore show diffraction and interference. Prior to performing atom interferometry atoms have to be trapped and cooled close to absolute zero by a combination of magnetic fields and laser light. Room temperature atoms with velocities of hundreds of meters per second would almost immediately collide with the walls of the experimental chamber and leave no time to perform experiments. After release from the trap laser pulses direct the falling atoms along two different paths and let them recombine. The acceleration of free fall can then be read out from the interference pattern of the atomic wave functions. Nowadays, commercially available quantum gravimeters feature an accuracy better than one part in 10⁸ of gravity [3,4] and are competitive to classical sensors. Their sensitivity could be improved by cooling the atoms further down until they reach an ultracold state of matter, called a Bose-Einstein condensate (BEC) where only a single quantum state is occupied. The size of a BEC is about 100 times smaller than typical millimeter-sized laser cooled clouds commonly used in atomic gravimeters. Such an ultracold cloud allows a more precise control of the atomic position and reduces the error due to spatially nonuniform laser pulse intensities. In our paper  we have demonstrated an atom-chip fountain gravimeter, using a BEC source with an intrinsic sensitivity of one part in 107 of gravity, where all operations can be performed in a volume of less than a one centimeter cube. In an atom interferometer beam splitting is based on the diffraction by an optical lattice generated by two counter-propagating laser beams. In our case, Bragg diffraction is employed, which can be described by the absorption and stimulated emission of a photon. During this process the atom receives an additional momentum kick. 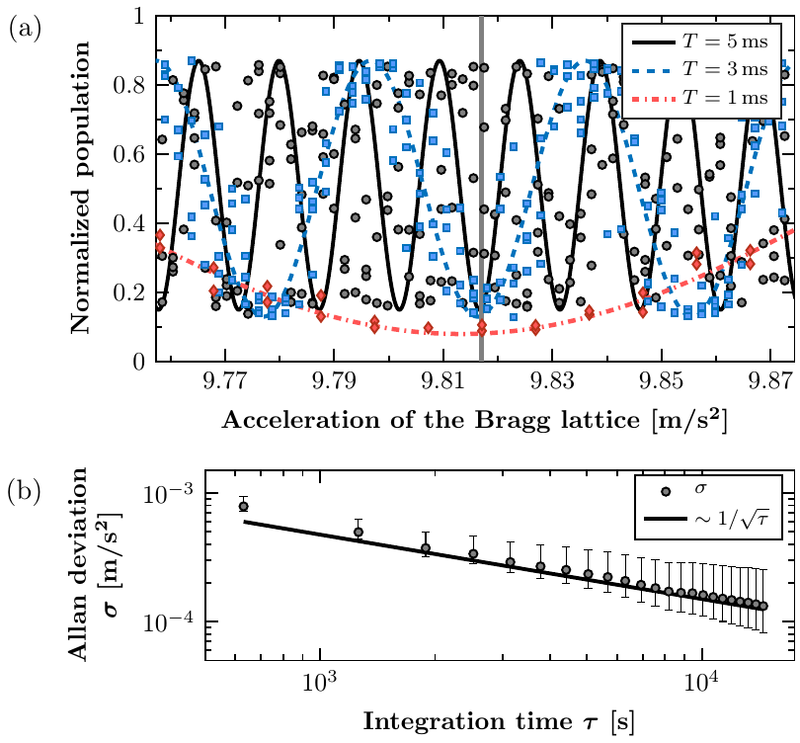 The duration and amplitude of the Bragg laser pulse determine the amount of atoms diffracted to another momentum state. The Mach-Zehnder interferometer starts with a beam splitter pulse that gives a velocity kick with 50% probability resulting in an equal superposition of two atomic momentum states (see Figure 1(b)). After a free evolution time of T, the momentum states are inversed by a mirror pulse. At a time 2T a final pulse recombines the wave packets and an interferometer signal consisting of two output ports separated by a velocity difference is created. The atom number in each of these ports is detected via imaging with a CCD camera. 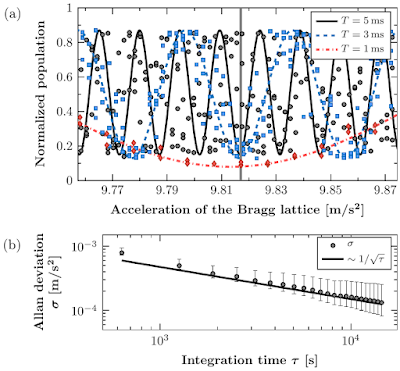 An acceleration such as gravity leads to a path difference between the two interferometer arms and influences the population of the output ports. In principle, each atom participates independently in the interferometer. Large ensembles, however, are important to obtain detectable and statistically significant signals. In such a free fall interferometer an important feature is the T square scaling of the phase shift, which directly links to the sensitivity. Hence, a gravitational sensor considerably benefits from an extension of the interferometer time. Unperturbed evolution times in the order of seconds can only be reached in very large devices , or on microgravity platforms . In a compact, earth-bound device, however, the atom cloud can only fall a short distance, which limits T to the order of milliseconds. 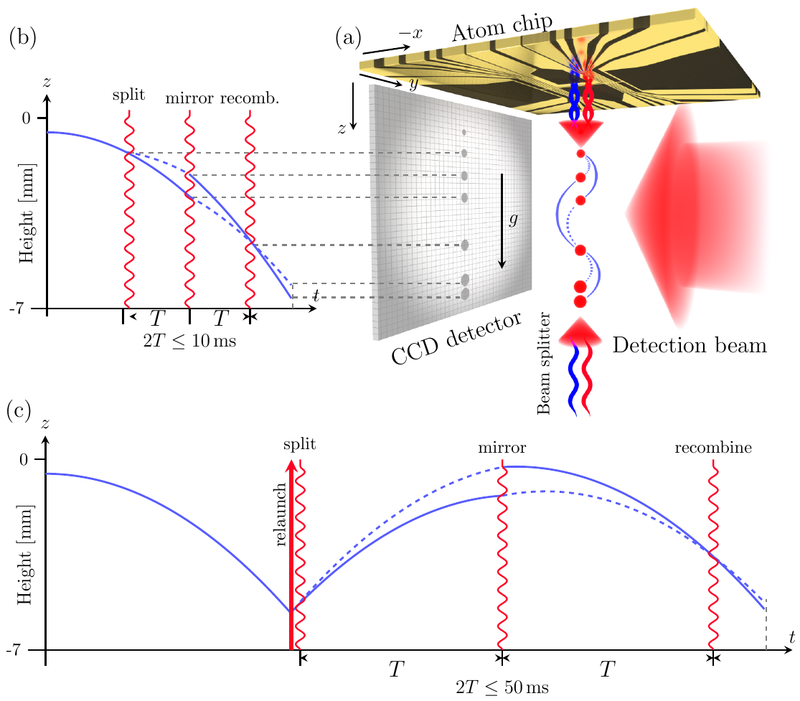 Figure 1: (click on the image to view with higher resolution) Atom-chip-based gravimeter (a) and spacetime trajectories of an atom cloud in a Mach-Zehnder interferometer without (b) and with relaunch (c). Adapted from Reference .. Figure 2: Centimeter-sized atom chip used for BEC generation. BEC-based inertial sensors have usually been large, laboratory-sized experiments . Our apparatus features a compact setup, provided amongst others by the use of a centimeter-wide atom chip [9,10], which allows a fast, robust and efficient generation of BECs (Figure 2). Inside a small vacuum chamber we repeatedly produce up to 15,000 condensed Rubidium-87 atoms at a temperature of 50nK [8, 11]. Each experimental cycle consisting of BEC generation and performing atom interferometry takes about 15 seconds. 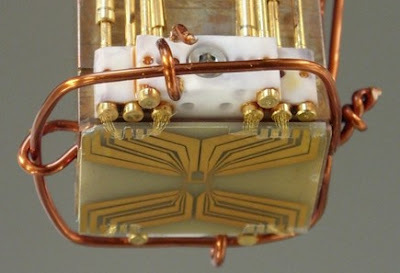 The atom chip is not only used for the whole state preparation of the BEC but also acts as a reference mirror inside the chip gravimeter (see Figure 1(a)). It is oriented horizontally and retroreflects the light pulses coming from an upwards-pointing laser. The interferometer region extends about 1 cm below the atom chip. Since the atoms are freely falling along the optical lattice, its velocity has to be constantly increased in order to match the gravitational acceleration of the atoms. If lattice and atomic acceleration are identical, only one state entering the interferometer is detected at the output. This means, our interference signal, the normalized population assumes a minimum independent of the pulse interval T. Local gravity is than deduced from the optical lattice acceleration which can be measured very precisely. Figure 3(a) shows interference signals in dependence of the lattice acceleration for pulse intervals of T=1,3 and 5ms in a dropped interferometer. The acceleration of free fall was determined to be g = (9.8134 ± 0.0006) m/s². After repeating the measurements with the maximal interrogation time T=5ms over 8h we achieved a relative precision of one part in 10⁵ of gravity (see Figure 3(b)). Figure 3: (click on the image to view with higher resolution) Measuring gravitational acceleration in a single fall interferometer. (a) Normalized atom number in one output port of the MZI for T = 1, 3, 5 ms depending on the acceleration of the Bragg lattice. (b) Allan deviation of the acceleration improves with the square root (black line) of the integration time t reaching a precision of 1 part in 10⁵ of gravity after 8 hours. Source: Reference . In order to improve the sensitivity of our interferometer we developed a simple and efficient fountain sequence illustrated in Figure 1(c). At the bottom of the detection zone the atoms are caught and tossed upwards with an optical lattice generated by the same laser light beams that are used for interferometry. This way, we are able to enhance the total free evolution time by a factor of three, without increasing the free-fall baseline of the experiment. The interferometer starts directly after the relaunch and can be extended to T=25ms. Its intrinsic sensitivity equals one part in 10⁷ which represents a 20-fold increase in comparison to the simple fall setup. Due to the environmental conditions and the absence of any vibrational isolation we were not able to observe fringes any more. However, we did a statistical analysis of the data and determined a high interferometric contrast of 80%. 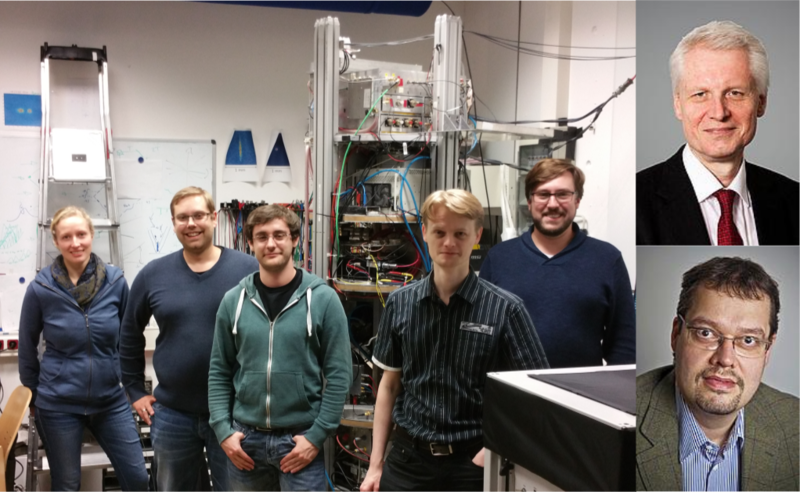 In conclusion, we demonstrated the first miniaturized atom-chip fountain gravimeter without and with relaunch. The new fountain scheme leads to extended interferometer times without changing the compact volume of a one centimeter cube. The sensor is currently limited by the large vibrations in our system, which we aim to suppress in the future. The current sensitivity of 1 part in 10⁷ of gravity is about two orders of magnitude lower compared to state-of-the-art sensors. However, with an advanced apparatus , which produces 10⁵ atoms in a BEC per second, and small improvements in the measurement scheme, we believe an intrinsic sensitivity of one part in 10⁹ is feasible. At the same time, further miniaturization can be done by using for example a pyramidal-shaped retroreflector  that reduces the size of the laser system. All these improvements open up the route to a backpack-sized device for high-precision absolute gravimetry utilized in remote locations. B. D. Tapley, D. P. Chambers, S. Bettadpur, J. C. Ries, "Large scale ocean circulation from the GRACE GGM01 Geoid". Geophysical Review Letters, 30(22) (2003). Full Article. Isabella Velicogna, John Wahr. "Measurements of Time-Variable Gravity Show Mass Loss in Antarctica“. Science, 311, 1754 (2006). Abstract. S. Abend, M. Gebbe, M. Gersemann, H. Ahlers, H. Müntinga, E.Giese, N. Gaaloul, C. Schubert, C. Lämmerzahl, W. Ertmer, W. P. Schleich, and E. M. Rasel, “Atom-chip fountain gravimeter”, Physical Review Letters, 117, 203003 (2016). Abstract. T. Kovachy, P. Asenbaum, C. Overstreet, C. A. Donnelly, S. M. Dickerson, A. Sugarbaker, J. M. Hogan, M. A. Kasevich, "Quantum superposition at the half-metre scale", Nature, 528, 530 (2015). Abstract. H. Müntinga, H. Ahlers, M. Krutzik, A. Wenzlawski, S. Arnold, D. Becker, K. Bongs, H. Dittus, H. Duncker, N. Gaaloul, C. Gherasim, E. Giese, C. Grzeschik, T. W. Hänsch, O. Hellmig, W. Herr, S. Herrmann, E. Kajari, S. Kleinert, C. Lämmerzahl, W. Lewoczko-Adamczyk, J. Malcolm, N. Meyer, R. Nolte, A. Peters, M. Popp, J. Reichel, A. Roura, J. Rudolph, M. Schiemangk, M. Schneider, S. T. Seidel, K. Sengstock, V. Tamma, T. Valenzuela, A. Vogel, R. Walser, T. Wendrich, P. Windpassinger, W. Zeller, T. van Zoest, W. Ertmer, W. P. Schleich, E. M. Rasel, "Interferometry with Bose–Einstein Condensates in Microgravity", Physical Review Letters, 110, 093602 (2013). Abstract. J. E. Debs, P. A. Altin, T. H. Barter, D. Döring, G. R. Dennis, G. McDonald, R. P. Anderson, J. D. Close, N. P. Robins, "Cold-atom gravimetry with a Bose–Einstein condensate", Physical Review A 84, 033610 (2011). Abstract. József Fortágh, Claus Zimmermann, “Magnetic Microtraps for Ultracold Atoms”, Reviews of Modern Physics, 79, 235 (2007). Abstract. Mark Keil, Omer Amit, Shuyu Zhou, David Groswasser, Yonathan Japha, Ron Folman, “Fifteen Years of Cold Matter on the Atom Chip: Promise, Realizations, and Prospects”, Jornal of Modern Optics, 63, 1840 (2016). Abstract. T. van Zoest, N. Gaaloul, Y. Singh, H. Ahlers, W. Herr, S. T. Seidel, W. Ertmer, E. Rasel, M. Eckart, E. Kajari, S. Arnold, G. Nandi, W. P. Schleich, R. Walser, A. Vogel, K. Sengstock, K. Bongs, W. Lewoczko-Adamczyk, M. Schiemangk, T. Schuldt, A. Peters, T. Könemann, H. Müntinga, C. Lämmerzahl, H. Dittus, T. Steinmetz, T. W. Hänsch, J. Reichel, "Bose–Einstein condensation in microgravity", Science, 328, 1540 (2010). Abstract. Jan Rudolph, Waldemar Herr, Christoph Grzeschik, Tammo Sternke, Alexander Grote, Manuel Popp, Dennis Becker, Hauke Müntinga, Holger Ahlers, Achim Peters, Claus Lämmerzahl, Klaus Sengstock, Naceur Gaaloul, Wolfgang Ertmer, Ernst M Rasel, "A high-flux BEC source for mobile atom interferometers", New Journal of Physics, 17, 065001 (2015). Abstract. Q. Bodart, S. Merlet, N. Malossi, F. Pereira Dos Santos, P. Bouyer, and A. Landragin, "A cold atom pyramidal gravimeter with a single laser beam", Applied Physics Letters, 96, 134101 (2010). Abstract.